We love to order take-out every once in awhile. These recipes made me realize that I should make Chinese at home more often! Heat oil in a large skillet over medium-high heat. Stir in green onions and garlic; cook 30 seconds. Stir in shrimp, and toss to coat with oil. Stir in sauce. 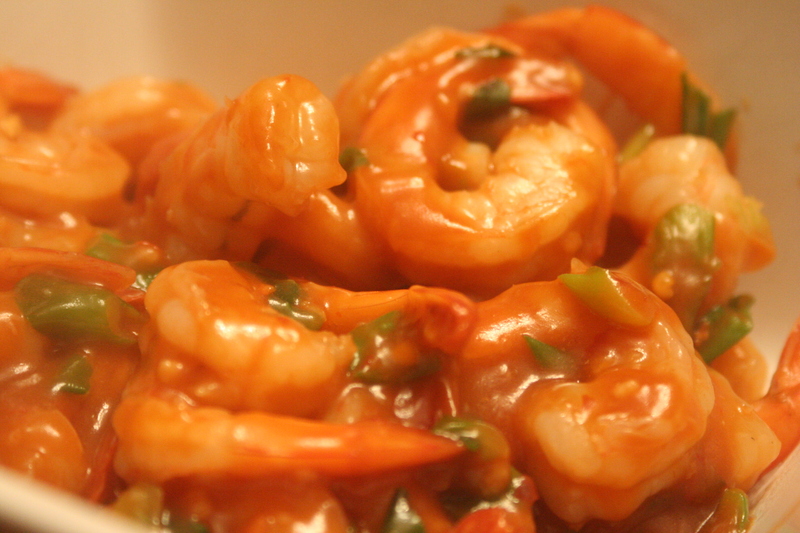 Cook and stir until sauce is bubbly and thickened and shrimp is fully cooked - about 5-7 minutes. Heat oil in a wok or skillet over medium high heat. Stir-fry ginger and garlic for 30 seconds. Add the steak and stir-fry for 2 min. or until evenly browned. Add the snow peas and stir-fry for an additional 3 min. Add the soy sauce mixture, bring to a boil, stirring constantly. Lower heat and simmer until the sauce is thick. Serve immediately. In a saucepan, combine 1 1/2 cups water, sugar, vinegar, reserved pineapple juice, and orange food coloring. Heat to boiling. Turn off heat. Combine 1/4 cup cornstarch and 1/4 cup water; slowly stir into saucepan. Continue stirring until mixture thickens. Combine flour, 2 tablespoons oil, 2 tablespoons cornstarch, salt, white pepper, and egg. Add 1 1/2 - 2 1/2 cups water gradually to make a thick batter. Stir to blend thoroughly. Add chicken pieces, and stir until chicken is well coated. Heat oil in skillet, fryer or wok to 360 degrees F. Fry chicken pieces in hot oil until golden. Remove chicken, and drain on paper towels. 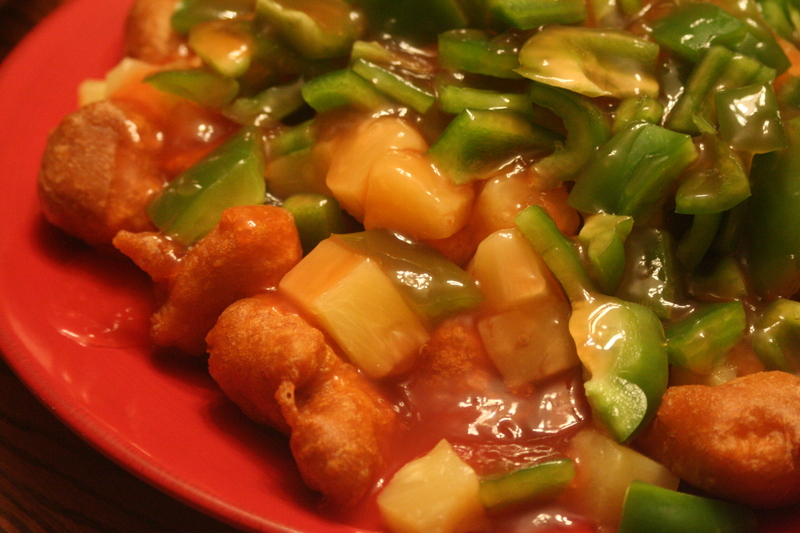 When ready to serve, layer green peppers, pineapple chunks, and cooked chicken pieces on a platter. Pour hot sweet and sour sauce over top. Serve with steamed rice if desired. 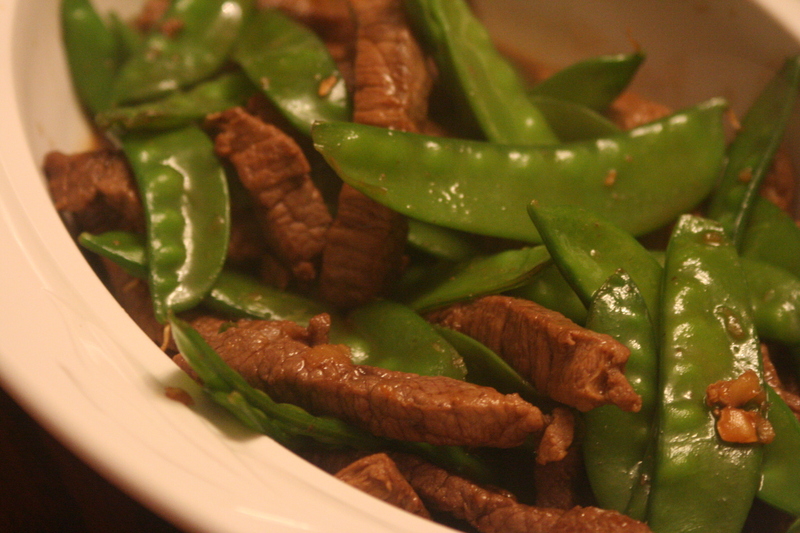 My husband loved the Asian beef with pea pods. I used red wine vinegar instead of rice wine vinegar based on what I had. Thanks for posting the recipe.